As a result of a robust economy, consumption habits have changed in India. 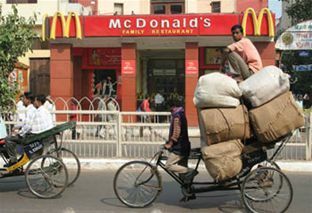 Featured among Business World’s ‘Most Respected Companies of India’, one multinational establishing a firm foothold in the emerging fast food market is McDonald’s. The advantages of operating in a flourishing economy like this are many fold for the restaurant chain, explains Arvind Singhal, Director, South McDonald’s India (West & South). Singhal will address the marcus evans Customer Experience & Service Innovation 2010 conference taking place in August. Citing India’s strong economic growth with a GDP of more than 12% and with total retail sales expected to grow by more than 11% annually (BMI India Retail Report May 2010), Singhal believes this vast country offers much potential for retailers. Offering the perfect ingredient for any industry – large disposable incomes – the Indian market has witnessed a marked change in consumption patterns, especially in terms of food, says Singhal.